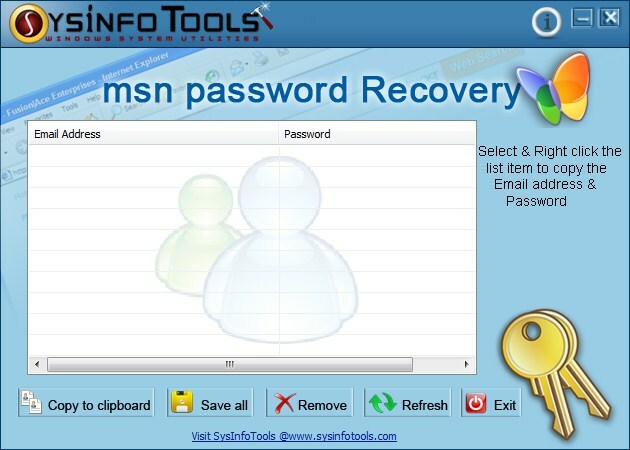 SysInfoTools MSN Password Recovery is a powerful password recovery tool to recover lost or forgotten passwords of hot mail or msn messenger instantly account from your computer. Easy to use with interactive user interface. SysInfoTools MSN Password Recovery is a powerful password recovery tool to recover lost or forgotten passwords of hot mail or msn messenger instantly account from your computer. Easy to use with interactive user interface. SysInfoTools MSN Password Recovery supports all major version of msn messenger 6.0, 6.2, 7.0, and 7.5. Keep all your passwords, userid's, codes, etc. safe and secure in just one place. - In todays world there are so many codes, that you have to remembers - now you just have to remember one, and all the other will be revealed. Use"Keep It (a) Secret".